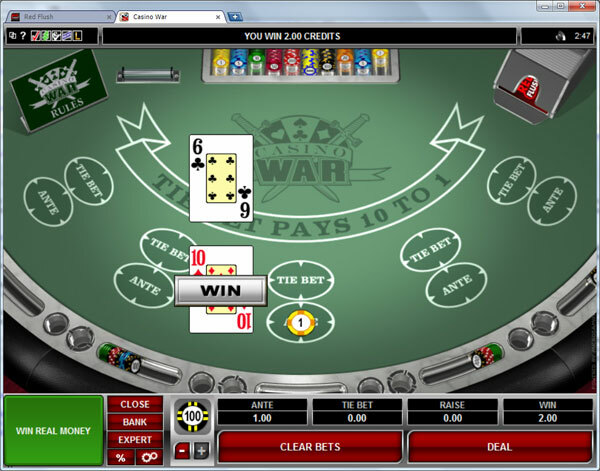 About casino war game online: Rules and tips. Casino war is one of the older card games that most children will remember playing in their youth. Casino War is one of the older card games that most children will remember playing in their youth. Although back then, the game was referred to, simply as War. This game is not as popular as you'd like to think, and only a handful of online casinos actually offer it to gamers, but it can be found with a bit of hard searching, and as far as simple cash casino games go, it may be worth a look. Casino War is played, practically the same as the game you played as a child. The object of the game is simple. The person with the highest card... wins. To begin with, both the player and the dealer are dealt a card, and whomsoever has the higher card, with Aces being high, wins the bet. Should there be a tie, then two additional options are available to the player. He may choose to surrender, meaning the player loses the hand, and the bet is returned to both the player and the dealer equally. Alternatively, the player may choose to go to war, by doubling his original bet, as does the dealer. Going to war can be considered the only difficult part of the game. When a player goes to war, the player must equal their original bet, before the game can commence. Once the bet has been made, the dealer will skip the next three cards in the deck, and deal the fourth card to the player, face up, and the fifth to himself. Should your second card fail to beat the dealers card then you will lose both your original and raised bets. However, should you beat the dealer, the original bets and the raised bets will now belong to you, as you have successfully won war. A tie side bet, is another aspect of Casino War. To place a tie side bet, you must deposit your bet before the dealer deals the cards. Placing an amount of the tie spot before the dealing, will ensure this. Should your first card tie with the dealers first card then you'll be paid out, generally to the sum of 10-1 on the original tie bet. Tie side bets are no longer applicable once the player has chosen to go to war with the dealer. Casino War is a popular game in the few places that house it, because the house edge really isn't that big at all compared to other online casino card games. The tie-side-bet however, may appear to be lucrative to the player but it actually isn't. The tie side bet actually has an 18-35% edge to the house with it, which would prove disastrous in the long run, if you don't pick up tied cards in quick succession in Casino War. Casino War cannot be played between other players, and is a game purely designed for you to play against the dealer. This coupled with the fact that the house edge is somewhat low has made a popular game for gamblers who find it in their online casinos. On the other side of the coin, this is also the reason a lot of online casinos do not feel the need to incorporate it into their card games section. The game might offer you a more than reasonable chance than winning, but because of this it is hard to find. Fortunately though, there are a number of card game review websites on the internet, that detail the intricacies of such games, and where to find them.